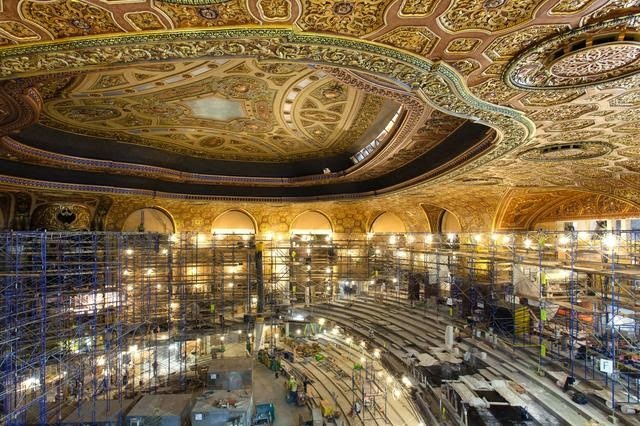 Ever since the intended restoration of the Loew’s Kings Theater in Flatbush was announced last year, excitement around the project has been growing. Known as one of only five “Wonder Theaters” in New York and New Jersey, the advancing restoration, due to conclude in January 2015, will bring the theater back to its glory days of 1929. "The Kings Theatre will serve as both a cultural and economic cornerstone for the Brooklyn community, presenting more than 200 performances annually—including music, dance, theatre, and comedy—providing a resource to foster and support creativity in the area, creating jobs and attracting thousands of visitors to the neighborhood." Photographer Matt Lambros has been chronicling the progress of the re-birth of the Loew’s ever since his first, pre-renovations photograph he took in 2011. Lambros has been keeping a blog, After the Final Curtain, which not only covers the progress of the Kings Theater, but also reveals the state of other crumbling performance spaces. With the help of the Theater Historical Society of America Lambros will publish a book on the subject in early 2015.